Martin Eakes speaks in high-minded tones when he condemns payday lending. But his decades-long vendetta against the industry, subsidized by taxpayers and taking place within federal regulatory agencies themselves, could drive more business to financial institutions that Eakes runs. Since 1980, when Eakes founded the Center for Community Self-Help (CCSH) in Durham, N.C., he has worked to push the American financial system toward a model he considers fairer and more transparent. His critics see different motives at play. With the help of like-minded activists and bureaucrats, Eakes has enlisted some of the country’s most powerful financial regulators in a political effort to shut down legitimate lenders that compete with Eakes’ own businesses. Chief among those businesses is the Self-Help Credit Union. A division of the CCSH, the credit union offers small-dollar loans and other financial products that compete with payday lenders. Studies show the products offered by Eakes’ companies benefit when payday lenders are restricted by legislation or regulation. Eakes, a left-wing housing policy leader who before the 2008 financial crisis described Self-Help as "one of the earliest subprime [mortgage] lenders in the nation," has used his seat on a federal advisory panel with influence over top financial regulators to push additional restrictions on payday lenders. His network of businesses and advocacy groups—which has cumulatively received more than $380 million in federal grants, loans, and other taxpayer assistance since 1996—has spent millions lobbying the federal government on measures including additional regulations on those lenders. The groups frequently tout their public policy work in official publications and communications. Eakes is one of at least nine individuals who have passed through a revolving door between the Self-Help network and positions at federal agencies that regulate financial firms with which his credit union competes. Eakes himself has simultaneously served as the chief executive of the credit union and an affiliated interest group, the Center for Responsible Lending (CRL), and an influential advisory post at the Federal Deposit Insurance Corporation, which has recently played a major role in combating the payday lending industry. The FDIC’s efforts are part of a larger initiative involving the Department of Justice and the Consumer Financial Protection Bureau called Operation Choke Point. The effort seeks to eliminate the ability of businesses that federal regulators deem distasteful, exploitative, or dangerous to obtain financing from major American banks. According to the payday lending industry, Operation Choke Point regulators have pressured banks to discontinue services to payday lenders that operate entirely within the law. Critics of the program say it is designed to shut down legitimate businesses that the Obama administration opposes on ideological grounds by pressuring banks to stop lending to the classes of businesses it singles out as allegedly destructive or illegitimate. In addition to payday lenders, businesses targeted by Operation Choke Point include gun stores, pornographers, rare coin dealers, tobacco companies, and dating websites. According to the House Oversight and Government Reform Committee, which began investigating the operation in 2013, "internal [DOJ] memoranda on Operation Choke Point clearly demonstrate that the Department’s primary target is the short-term lending industry—an indisputably lawful financial service." DOJ and other agencies involved in the effort insist that the operation is merely an effort to advise financial institutions on the advisability of lending to what the department calls "high-risk" businesses. The FDIC says it is ensuring that banks that receive federal deposit insurance are not knowingly lending to businesses engaged in legally questionable activities. However, former FDIC chairman William Isaac has called the operation "one of the most dangerous programs I have experienced in my 45 years of service as a bank regulator, bank attorney and consultant, and bank board member." "Operating without legal authority and guided by a political agenda, unelected officials at the DOJ are discouraging banks from providing basic banking services—deposit accounts, payments processing services, and payroll accounts—to lawful businesses simply because they don’t like them," Isaac wrote in a November Wall Street Journal column. The Oversight Committee echoed that warning in a December report, saying that the program has "den[ied] countless legal and legitimate merchants access to the financial system and deprive them of their very ability to exist. Accordingly, Operation Choke Point violates the most fundamental principles of the rule of law and accountable, transparent government." Its initial investigation explored DOJ’s role in the operation. The December report looked at the role the FDIC played. "Operation Choke Point is an abuse of the [FDIC’s] statutory authority," the committee concluded. As the FDIC took on a larger role in Operation Choke Point, high-level agency officials, including its chairman, received regular briefings from Eakes and Wade Henderson, a CRL board member. Both sit on the FDIC’s Advisory Committee on Economic Inclusion. In that capacity, they have recommended to agency leadership regulatory steps to crack down on the payday lending industry. Eakes has used his position to that end since at least 2007, according to the minutes of the advisory committee’s meetings. In March of that year, FDIC regulators presented to the board a pilot project "to expand the availability of reasonably-priced small-dollar loans." Self-Help provides just those types of loans. Its Credit Builder Loans program offers up to $3,000 in financing with payment terms between six and 24 months. Its WealthBuilder Loans provide $500 to $10,000 in financing repayable in one-to-four-year terms. When the FDIC floated the pilot program, Eakes said it could be used as a means to eliminate the competition. Eakes "suggested that the most valuable outcome of the pilot project might be to convince policymakers that there is an alternative to payday loans, thereby making it more palatable to prohibit payday loans," according to minutes of the meeting. Seven years later, Eakes was still using his position on the advisory panel to push for regulators to crack down on payday lenders. "The actual cost of a payday loan ends up being greater than the anticipated benefits in almost every case, indicating that this model presents serious dangers to consumers," he claimed during an April 2014 meeting. Despite such claims, payday lending remains extremely popular with the consumers who use such products. A 2007 survey found that 87 percent of payday borrowers were "very" or "somewhat" satisfied with the service. Just 10 percent were "very" or "somewhat" dissatisfied. A 2013 survey commissioned by the payday lending industry found similar levels of satisfaction with the financial products offered. Part of the reason for those high levels of satisfaction may be due to the simplicity of a standard payday loan. "Payday loans are very simple and very transparent loans with a small number of terms, especially when compared to especially complex products such as mortgages or credit cards," according to George Mason University law professor Todd Zywicki. Additionally, payday loans—which frequently cover unforeseen emergencies such as home or auto repairs—are often a less expensive alternative to other forms of short-term financing. "Those who use payday loans have limited alternative sources of credit, such as pawn shops, bank overdraft protection, credit card cash advances (where available), and informal lenders," Zywicki explained in a 2009 paper. "Although expensive, payday loans are less expensive than available alternatives." In addition to its short-term financing options, Self-Help offers some of the more popular alternatives to payday lending, including debit account overdraft protection and credit card cash advances. Frequently those services are in effect more expensive than the payday loans they replace. One FDIC study estimated the de facto APR of a typical overdraft purchase to be between 1,067 percent and 3,520 percent. Whether or not Self-Help’s products specifically are more expensive than the average terms of payday loans, they do provide alternatives to those loans, and hence compete with them for customers looking for short-term financing. Regulatory and legislative efforts to restrict payday lending have redounded to the benefit of financial institutions that offer the same types of products as Self-Help, studies show. A law in Oregon that capped short-term interest rates "reduced access to payday loans in Oregon, and … former payday borrowers responded by shifting into incomplete and plausibly inferior substitutes," one study found. "Most substitution seems to occur through checking account overdrafts of various types and/or late bills." States that banned payday lending outright, such as Eakes’ home state of North Carolina, saw similar results. Henderson told the Senate Banking Committee in July 2001 that Eakes had "craft[ed] a comprehensive legislative package in North Carolina" to crack down on payday lending. A month later, the state banned the practice. A 2007 Federal Reserve Bank of New York study on North Carolina’s move, and a similar crackdown in Georgia, found that banning payday lenders led to more bounced checks and bankruptcy filings. Additionally, the laws drove more borrowers to credit unions that would otherwise have gone to payday lenders. The study’s findings, its author wrote, suggested "that payday credit is preferable to substitutes such as the bounced-check ‘protection’ sold by credit unions and banks or loans from pawnshops." Federal regulations that crack down on the industry would likely have a similar impact. Eakes’ critics say that that fact demonstrates an inescapable conflict of interest in his work at FDIC to tighten regulations on—or completely do away with—payday lending. "This isn't supposed to happen in America," said Phil Kerpen, president of the conservative group American Commitment. Kerpen has criticized Eakes and Herb Sandler, his CRL cofounder and a high-dollar Democratic donor, for pushing housing policies that encouraged subprime mortgage lending leading up to the 2008 financial crisis. Eakes "is apparently using his close relationship with the Obama administration to choke off banking services from companies whose only crime is being his competitors," Kerpen said. In addition to Eakes and Henderson, Mark Pearce, the former president of the Center for Responsible Lending, has used his current post as the director of FDIC’s Division of Depositor and Consumer Protection to push stringent restrictions on payday lending, according to emails obtained by the Oversight Committee. As Operation Choke Point kicked into gear at FDIC, emails showed, Pearce and his division pushed Chairman Martin Gruenberg to more actively target payday lenders. "The Chairman is meeting with some bankers next week, and DCP wants to give the Chairman some ‘talking points’ as to how banks facilitate payday lending and why the FDIC is concerned," wrote FDIC senior counsel Marguerite Sagatelian in a March 8, 2013, email. Prior emails suggest that those talking points, and other FDIC efforts concerning payday lending, were designed to restrict the industry—or eliminate it altogether. Another Sagatelian email noted that Pearce was exploring ways for FDIC to "get at payday lending." In another, she refers to Pearce’s "interest in trying to find a way to stop our banks from facilitating payday lending." One email shows director of FDIC’s Atlanta Region told Pearce that the agency was working on "getting the banks out of" working with payday lenders. "Glad we’re on the same page," Pearce replied. Some DCP employees warned Pearce that his division’s ideological opposition to payday lending had empowered FDIC bank examiners who often exceeded their regulatory authority in pushing banks to cease doing business with those lenders. Such tactics invited congressional scrutiny, they warned. "I may have to confront the issue of overzealous examiners (immoral issue). I would do so by making clear that it is not fdic [sic] policy to pass moral judgment on specific products," one of Pearce’s deputies told him in an email obtained by the Oversight Committee. "Some of the pushback from the Hill is that it is not up to the FDIC decide what is moral and immoral, but rather what type of lending is legal," an FDIC spokesman told Pearce in another email. FDIC regulators nevertheless succeeded in convincing banks to sever business ties with legally operated payday lenders. A lawsuit filed against the FDIC by the Consumer Financial Services Association, the industry’s trade group, notes nine of its member companies suffered financially as a direct result of pressure put on banks by Operation Choke Point regulators, including those in Pearce’s division. The DCP was created in 2010 in part to "complement the activities of the new Consumer Financial Protection Bureau," according to the department. Since FDIC has come under fire for its role in Operation Choke Point, CFPB has taken a larger role in targeting payday lenders. As it has assumed that role, agency brass has routinely met with Eakes and other CRL and Self-Help executives, CFPB meeting logs show. 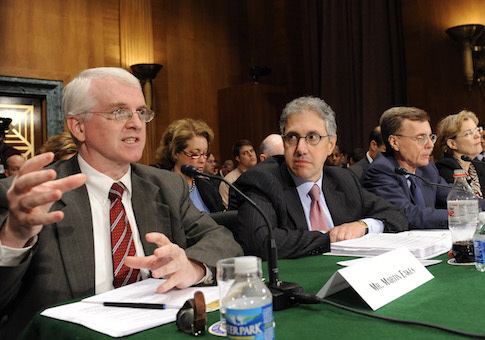 Eakes’ access to the bureau’s top regulators began even before CFPB was officially formed. In March 2011, he spoke with Elizabeth Warren, who would become a special adviser to the bureau and its de facto leader before she was elected to the U.S. Senate. Since then, CFPB director Richard Cordray has held 10 meetings with CRL and Self-Help employees, including three with Eakes. Eakes has also met with CFPB’s current and former deputy director. As bureau regulators solicited guidance from CRL and Self-Help employees, they were devising regulations on the payday lending industry. Cordray held a field hearing on the issue on March 25, two weeks after one of his meetings with CRL staff. Cordray and his agency are now working on rules designed to more stringently regulate the payday lending industry. They are expected to consider borrowers’ "ability to repay" in assessing the legality of payday loans, a metric that Eakes actively promoted in his FDIC advisory role. Like FDIC, which also employs former Self-Help associate general counsel CRL senior counsel Keith Ernst and CRL litigation counsel Seth Rosebrock, CFPB has significant staff overlap with Eakes’ network of financial institutions and interest groups. Cordray’s field hearing came shortly after Leslie Parrish, the program manager for CFPB’s work on payday and small-dollar loans, left to be the deputy research director for CRL. Bill Bynum helped create the Self-Help Credit Union and served as its associate director before founding the Hope Credit Union in Jackson, Miss. Bynum now chairs CFPB’s Consumer Advisory Board, where he has made policy recommendations explicitly designed to drive more business to credit unions. "How can people access the credit they need without payday loans? Credit unions can serve this need, as long as they have the capital and motivation to reach out to un- or under-banked people," he told advisory committee members in a February 2013 presentation. At the time, Bynum’s co-chair on the advisory committee was Jose Quiñonez, CRL’s former California Outreach Director. As Operation Choke Point kicked into gear, CRL hailed efforts by FDIC, CFPB, and DOJ to more tightly regulate payday lenders. "Taken together, these actions reflect a broader movement to end abusive debt-trap payday loans, and affirm that state and federal regulators have the tools to address this type of predatory lending," CRL said in a press release. However, that effort is likely to face additional scrutiny this year as Republicans assume the majority in the Senate and increase their control over the House of Representatives. Rep. Blaine Luetkemeyer (R., Mo. ), who has introduced legislation to counter Operation Choke Point, has praised efforts at DOJ and FDIC to review efforts to cut off financing for legally operated businesses. But he recently suggested that Congress would continue to monitor the program. Internal reviews, he said, are "a great first step in ensuring that those responsible for Operation Choke Point are held accountable and that Congress and the American people receive details and answers they deserve."